The Gold Australian Pig Coins from the Perth Mint come with gold bullion and proof coins. The Lunar Series II collection debuted in 2008 and features its final design in the 12-coin release with the Year of the Pig issue. Designed once again by Ing Ing Jong, the coins offer a brilliant conclusion to the series. Right now, the 2019 1/20 oz Gold Australian Pig Coin is available to purchase online at Silver.com. Coins ship to you inside of protective capsules or sealed rolls of 20 coins! 12th and final issue of the Lunar Series II coins! Mintage of 1/20 oz coins is unlimited! Consists of 1/20 Troy ounce of .9999 fine gold in BU condition. The reverse face includes the all-new Year of the Pig design. 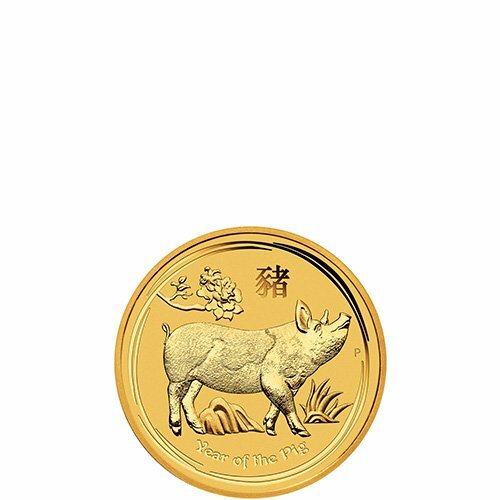 Each of the 2019 1/20 oz Gold Australian Pig Coins in this listing represents the smallest coin in the release. There are a total of four fractional weights available, with the 1/20 oz coming in behind the 1/10, 1/4 oz, and 1/2 oz gold options. The 2019 Gold Australian Pigs are available in this weight in individual protective capsules and sealed rolls of 20 coins. The Gold Australian Pig Coins from the Perth Mint come with a total of four fractional weights and four weights at or above 1 oz gold. These coins include 1 oz along with 2 oz, 10 oz, and 1 Kilo options. These 2019 1/20 oz Gold Australian Pigs have an unlimited mintage, meaning the mint will coin them through the end of 2019 to meet demand. 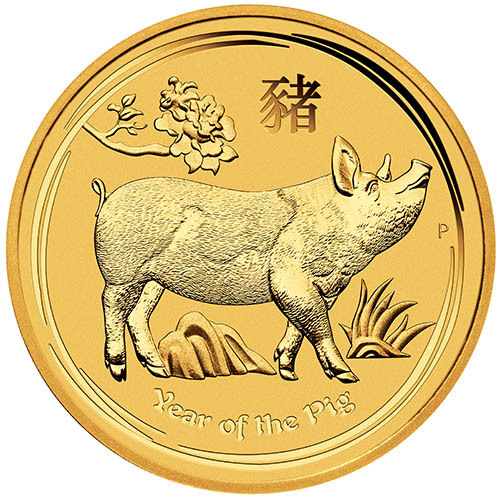 On the reverse of 2019 1/20 oz Gold Australian Pig Coins is the image of the pig. The design for the gold coins includes only a single pig, captured in right-profile relief and comes with background images of a tree branch, rocks, grass, and the Chinese symbol for the word pig. 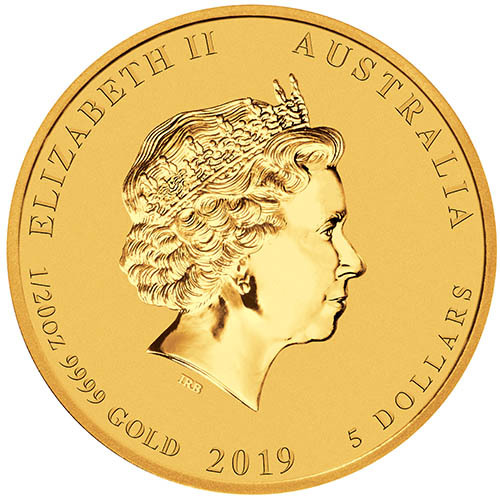 The obverse of 2019 Gold Australian Pig Coins includes the fourth-generation portrait of Queen Elizabeth II. This effigy of Her Majesty was created in 1998 by Ian Rank-Broadley and remains in use on a few Commonwealth coinage. This is among the last coins from the Perth Mint to feature the fourth-generation design of the Queen. If you have any questions about the Gold Australian Pig coins, please feel free to reach out to Silver.com. You can connect with us at 888-989-7223, chat with us live online, or via our email address. You can also use our website to follow the latest changes in the spot price of gold!